This patient of Dr. Umar chose to undergo a hair restoration procedure using grafts taken from both the head and beard regions. He was able to achieve an outstanding result with a donor pool consisting of 4500 grafts. Prior to seeing Dr. Umar, the patient had undergone a prior strip surgery performed at another clinic. At this time, he had wanted to improve upon his Norwood 6 hair loss. However, his overall growth from this procedure was quite disappointing with pluggy grafts, continued sparseness on top of his head and in parts of his crown and an obvious line of emptiness due to the linear scarring. Due to his exhausted head donor supply remaining on his scalp, recovering a full and youthful head of hair would have been quite unrealistic through traditional forms of hair transplant surgery. 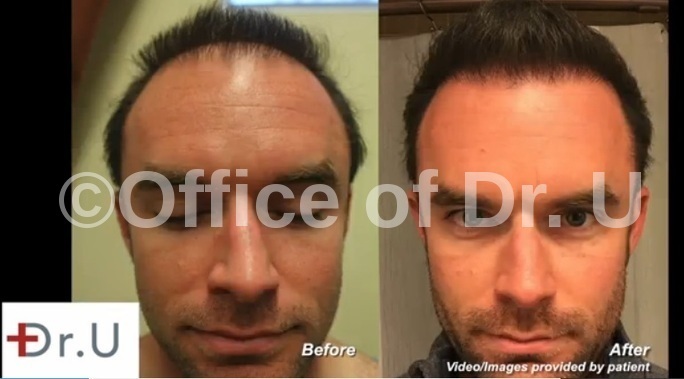 However, since Dr. Umar’s patented Advanced Follicular Unit Extraction technology, UGraft, is designed to safely remove large quantities of atypical follicles, the use of beard hair grafts presents a viable solution for patients like the one shown here. Dr. Umar was able to compile an abundant donor supply consisting of 4500 grafts derived from the head and beard areas. With this resource, the patient was able to attain the flattering results he wanted without having to settle for a second best form of improvement. 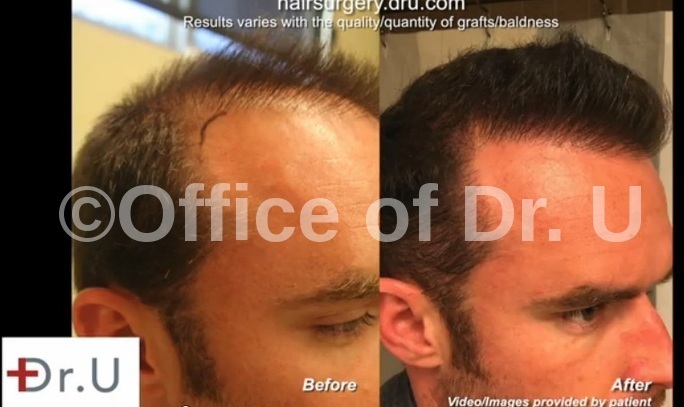 Following the graft extraction phase, Dr. Umar carefully inserted the follicles to recreate true to life hair growth patterns on the different regions of the scalp. The hairline and temples were designed to suit the patient’s facial characteristics. And nape hair was inserted along the very edges of these contours for a realistic softness. Due to living a long distance away from the clinic, the patient created video footage to document his results at the half-way point of 9 months. Here are before and after images.